Grenchen, Switzerland, March 8 2017 – Micro Crystal, the leading provider for quartz crystals, oscillators, OCXOs and Real-Time Clocks for the world's leading electronics industry now offers the popular oscillator in the advanced tiny package of just 1.2 * 2.0 * 0.7 mm. 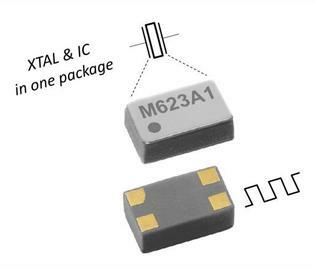 This hermetically sealed package hosts the integrated circuit together with the XTAL. It withstands harsh environmental condition. Aside the large supply voltage range it features very low power consumption. In active mode it draws as low as 1 μA driving one CMOS load. Since the oscillator is running also in stand-by mode (i= 0.45 μA) the accurate frequency is available instantaneously, no delayed startup time, as typical e.g. for AT-oscillator, must be cared for. Through factory calibration the accuracy is superior to solutions with external XTAL. Emergency Call Units, Remote Keyless Entry systems.